BILL FRAKES and JOHN OGDEN. 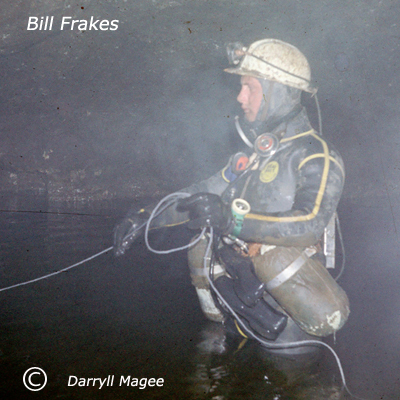 The first time Bill Frakes came to my attention was an item in the Bradford local paper about a 17 year old boy scout from Eldwick near Bingley free diving the static sump in Elbolton Cave. Afterwards Bill joined the BPC and I then came into contact with him via Pete Livesey in 1964. I always believed that I was responsible for introducing Bill to John Ogden and John Southworth and the Wanderers. During 1965 I think, Bill Frakes, Colin Vickers, Mick Ormerod, Dave Stewart, and I were training with diving gear in a deep pool in the river bed below Keld Head when a Landrover drew up alongside. Len Platt was driving and John Ogden and John Southworth: both whom I knew climbed out and came to meet and have a chat with us. Later we came together to form the Northern Section of CDG, and all of us would in the future partner Oggie and Bill on many cave dives. John Ogden always known as Oggie to his friends was an apprentice engineer who lived in Colne. He and Frank Barnes, another prominent member of the Happy Wanderers grew up together and were childhood friends. He was a quiet thoughtful young man who never pushed himself to the front of the party, but he was always ready to push a little bit harder if it was required. Bill and Oggie attended a number of the Northern CDG dive training sessions at Keighley Baths during 1965 and also they were with a group of us from the Wanderers at Malham Tarn, when Ken Pearce (who was the diving officer of the Northern CDG) assessed us for our cave diving qualification. Shortly after that, they became a two man team and carried out many dives together. Some of the dives that we did as a team were in Langstroth cave, where we put in many hours ferrying the poles through the sumps to scale the 45 foot aven. In Skirwith Cave 1966 Bill and Oggie together with a number of us; all divers from the Wanderers carried out a series of dives in the final sumps of this difficult cave. Bill and John Southworth dived the last sump for a distance of 150 feet before having to turn back at an underwater choke. 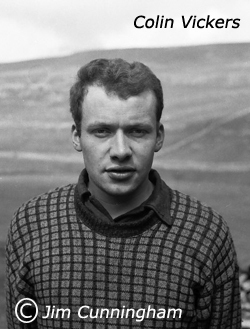 In May 1966 for three consecutive weeks a large group of wanderers members turned up at Malham Cove where Oggie, Bill, Dave Stewart and John Southworth passed an underwater constriction about 70 feet in from the entrance, which had previously proved impassable to divers using rebreathing apparatus, completing a distance of 150 foot. In doing so set the scene for future diving activity here. In September Oggie did a fine exploratory dive at Deepdale rising. In May 1966 Oggie, Dave Stewart and I passed a tight sump in Great Douk to emerge in the newly discovered Southerscales pot. Prior to the dive when we were discussing who would dive first, Oggie spit on a flat stone and tossed this in the air; the wet stone being a substitute for a coin. In 1966 a large group of the Wanderers went down to Bristol University to the BSA conference. The first night Oggie and I shared a sleeping bag camping out on the green space above the Avon Gorge. But on the second night Oliver Lloyd let us sleep on the floor at his house. I remember Oggie having some fun with a large moose’s head fixed to the wall in Oliver’s lounge. Bill was an apprentice joiner with his Dads building firm (Frakes and Wrigglesworth). He was quite a good poet sometime scribbling a poem whilst sat talking. The last time I saw Bill was on the Thursday before he died. He met me at the water treatment plant where I was working. He planned to assist me to dive into a deep tank to recover some equipment that had been dropped in. Bill was quite a charismatic character; he was continually joking and very good fun to be with. He did his first cave dive with me in Langstroth Cave in November 1965 and I can tell a story of him joking before the dive. The cave passage as you come up to the first sump is a water filled canal, with the roof of the cave sloping downwards into the water and forming the 45ft. sump. After I had donned my diving gear I submerged myself in the canal leading to the sump to test my headlight, air supply and buoyancy. I felt a tap on my helmet and raised myself up to see what had happened. Bill who was standing in the canal next to me asked “what are you doing “I am checking out my gear before the dive” At this he muttered something about me wasting air and he began to sing the words of the latest release by the Rolling Stones (The Last Time) I include this anecdote, simply to reveal the humour of the man. COLIN VICKERS by Mick Melvin. 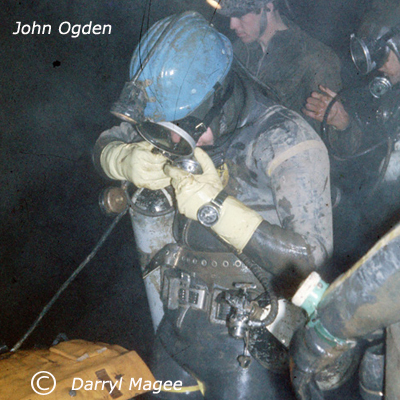 I knew Colin as a member of the Bradford Cave Rescue team formed in 1960 to assist the Main C.R.O. team if required. We helped out on many practise rescues together and he came with the team to Wales when we were searching for some students missing in a mine. He was a particular friend of Pete Livesey and I believe he was introduced to Bill Frakes through their mutual friendship. After leaving school Colin joined the tax office in Bradford, shortly before he died he worked at International harvesters where he made parts for the tractors’. Colin was the only one of the deceased cavers to have a child. Rachel was 18 months old at the time of the Mossdale tragedy. In 2014 Rachel made contact with me and I arranged for her to make her first visit to the cave. This was done with the assistance of Dave Nelson and Pete Huff of UWFRA who provided the team’s Landrover to get her to the cave.